Há uns dias, ao fazer umas arrumações, encontrei este frasco de vidro, com uma tonalidade linda! Gosto quando há flores frescas em casa, nem que seja só uma. E, como já escrevi antes por aqui, os pequenos detalhes fazem a diferença. Inspirem-se este fim-de-semana com mais uma edição da Gatherings magazine, cheia de ideais frescas para a Primavera que está aí a chegar, uma entrevista a Holly becker do conhecidíssimo decor8, uma proposta para decorar a mesa da Páscoa feita pela nossa conterrânea Susana do blog citrus and orange. Some days ago, while doing some Spring cleaning, I found this glass jar with a beautiful hue of green. I love to have fresh flowers at home, can be just one. As I've written here before, I think that the simple details matter. The tea-cup is there as a tea-light holder. 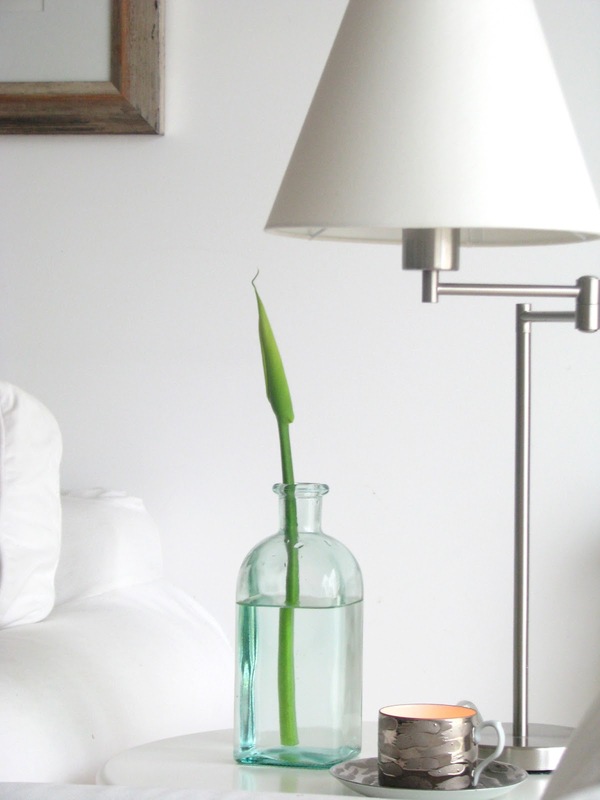 It's is a great way to add something unexpected to your room decor and repurpose a single tea-cup you might have at home. Did you know that there's available the new issue of Gatherings magazine? It is full of fresh ideas to get your home prepared for Spring, an interview with Holly Becker from the so-well-known decor8, a Easter table setting styled by Susana from the blog citrus and orange. I'll enjoy the magazine during the following days. Andreia, you always share the cutest links and ideas, I love your little vignette.